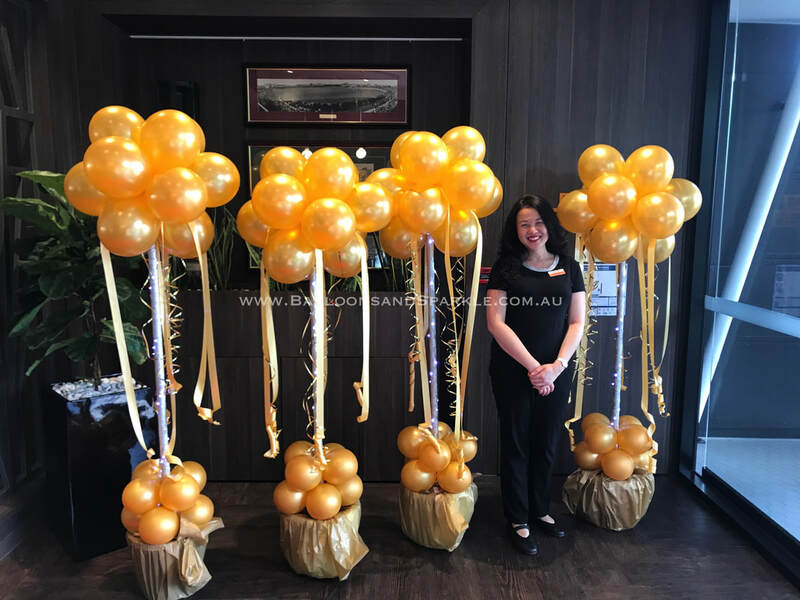 Sparkle Balloon Topiary Trees can either be large - freestanding from the floor or small where they are placed on tables, buffets etc. 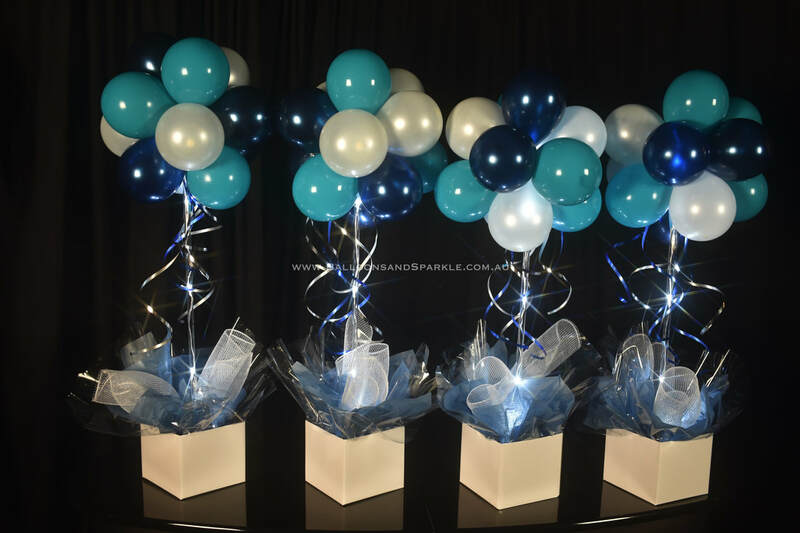 These are all air filled decor pieces and hence they last for days, we colour theme them to suit your function and of course every one of our Sparkle Balloon Topiary Trees are lit up with Sparkle. 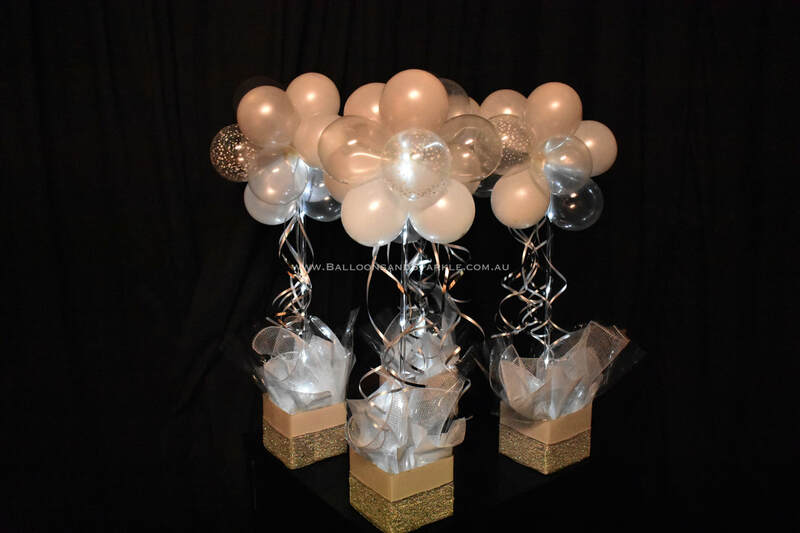 They are so popular and affordable for corporate functions, wedding, parties, birthdays, indoors or outdoors. The small balloon topiary trees are yours to keep, the large ones are hired and will be collected after the event. These are samples of large balloon topiary trees, freestanding around the room, at entrances and more. ( minimum of 4 - pots / poles are hired, we collect them after the event.). These can be created in any colour combination to suit your theme. 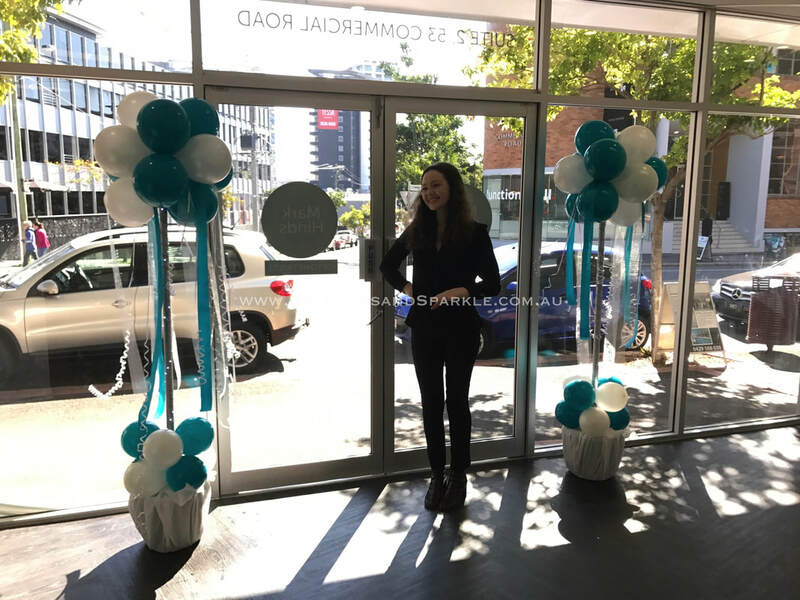 2 Beautiful Teal and White Large balloon topiary trees placed either side of the entrance to this Optometrist store in the Valley, they were in place for more than 2 weeks and looked excellent the entire time. Price from only $45 each. ( minimum of 2 - pots / poles are hired, we collect them after the event.). Small white wedding Sparkle table topiaries tree with an acrylic rod through the centre down to a posy box with cello and tissue paper. These take 3 AA Batteries which are included, are beautifully elegant and bright, we add curly ribbons and the lights thread up through the centre. Prices from $40 each. Small Teal blue and white Sparkle table topiary trees with an acrylic rod through the centre down to a posy box with cello and tissue paper. These take 3 AA Batteries which are included, are beautifully elegant and bright, we add curly ribbons and the lights thread up through the centre. Prices from $35 each. A small white wedding table topiary tree with Sparkle Ribbon wrapped throughout, beautiful wire edged ribbon and enhanced with Sparkle Lites fiber optic fireworks. Elegant and perfect for weddings, priced from only $45 each & they are yours to keep after the event. A small blue table topiary tree with Sparkle Ribbon wrapped throughout, beautiful wire edged ribbon and enhanced with Sparkle Lites fiber optic fireworks. Elegant and perfect for weddings, priced from only $45 each & they are yours to keep after the event. A small pink table topiary tree with Sparkle Ribbon wrapped throughout, beautiful wire edged ribbon and enhanced with Sparkle Lites fiber optic fireworks. Elegant and perfect for weddings, priced from only $45 each & they are yours to keep after the event.